BridgeU Insights takes data-driven guidance to the next level. 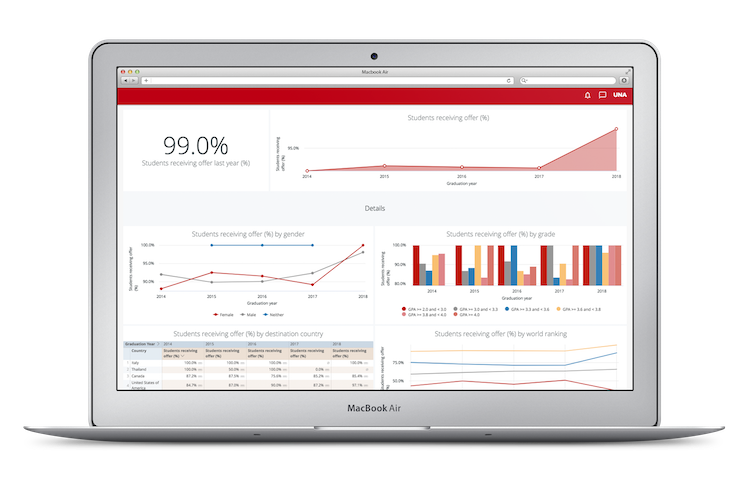 Read how Insights lets you visualise your school’s performance like never before. Since BridgeU began in 2014, we’ve been passionate advocates of using data to inform and improve university and careers guidance. 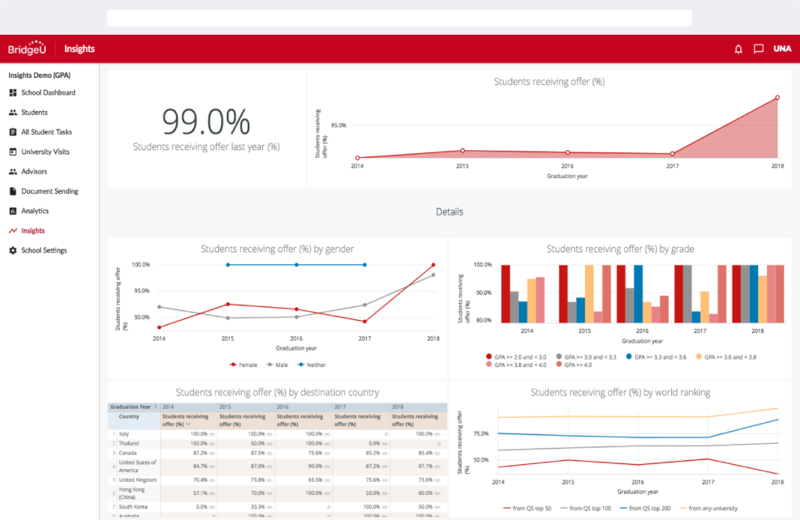 Our existing BridgeU Analytics tool has helped us to provide schools in over 100 countries with the ability to collate data on their students’ outcomes and analyse trends relating to school performance. But we wanted to go further in our quest to bring data-driven guidance to schools worldwide. We wanted to make BridgeU a platform that gives schools a deeper understanding of their data and the power to shape that data to their needs. Which is why we’ve built a new data analysis and reporting tool that gives schools a more complete overview of what’s driving student outcomes and how these outcomes compare with other schools across the globe. It’s why we’re so excited to introduce BridgeU Insights. University and careers guidance exists against the backdrop of a higher education sector that is becoming more international and, by extension, more competitive. For example, another 120 million international students are estimated to be enrolled in higher education by the year 2030. For schools to compete against such a backdrop, counselors and school leaders need the power to fully measure and assess the impact of their guidance strategy, in order to deliver continuous improvements in outcomes and results. But building a data-driven guidance strategy that truly enables a school to compete in a global university admissions market is often easier said than done. Specifically, schools face three key obstacles when attempting to more effectively leverage their data. If a guidance counselor can’t visualise and easily present data, it’s difficult to analyse trends and report on the factors affecting performance. In short, it’s hard to tell a story with data. For example, let’s say that a guidance counselor wanted an easy, historical overview of their student’s acceptance rates into a QS Top 50 university, as well as the underlying factors affecting these acceptance rates. For too many schools, managing this data often takes hours of unnecessary manual work, with unnecessary time spent on gathering the data, monitoring it and updating multiple spreadsheets and databases. This is the second major obstacle. It’s difficult for guidance counselors and school leadership teams to meaningfully measure their students’ performance against those of other schools. A school’s ability to visualise their own performance is only one piece of the puzzle. Without the means to measure performance against national and international benchmarks, data on students’ outcomes lacks context, and may even be misleading. Schools need to prove they’re delivering results, especially when dealing with prospective students and parents. But again, showcasing outcomes and demonstrating results can be hard when you’re pulling data from multiple sources and analysing it yourself. 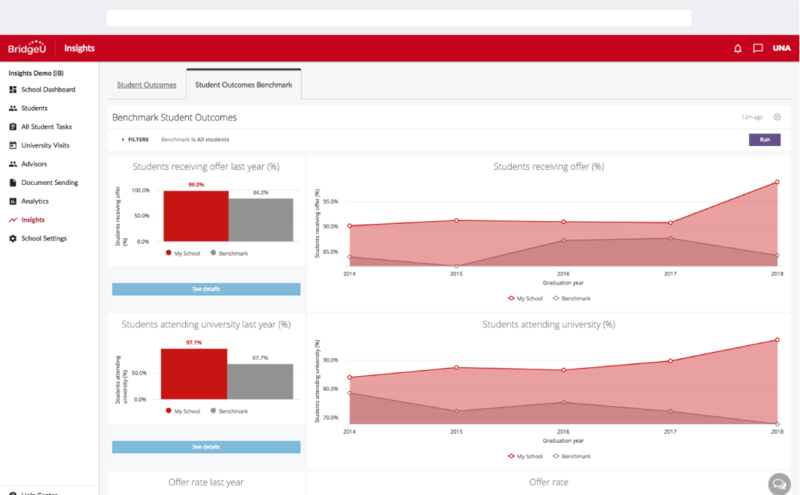 Easily visualise students’ university admission trends, with the ability to conduct in-depth analysis of the outcomes that really matter. Benchmark student outcomes, allowing a school to gain a fuller understanding of how it compares and competes. Quickly and easily create data-rich reports on key outcomes and performance indicators, that can easily be shared with leadership teams, school boards and parents. Let’s dig a little deeper into how Insights works, and how your school can make the most of it. Let’s face it. Data analysis can be hard. And if it’s just a series of facts and figures rendered in a spreadsheet, then people reading it are going switch off pretty quickly. That’s why we’ve designed Insights to give you an easy overview of the student outcomes that really matter to your school. It’s never been easier to visualise your school’s data and, more importantly, to tell a story with it. How many university applications students are submitting in an academic year. Where students are choosing to apply to university and whether they take up a place. How aspirational students are choosing to be in their applications. The offer rates and overall success rates of your students. Get a general overview of how many students applied in a given year. See the average number of applications per student. See how many countries your students applied to. See the total number of universities your students applied to. It’s never been easier to track the diversity of destinations your students are applying to, and how many students are participating in the university application process. The number of students who received at least one offer from a university. The total number of offers received by your students as a percentage of applications sent. Students have their offers – but how many of them are choosing to accept a place at university? 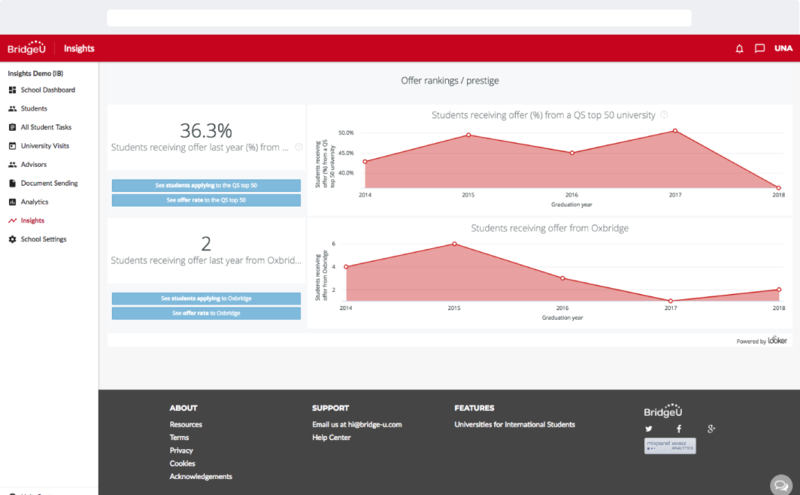 Insights lets you easily see the number of students who actually went on to attend university and how this relates to your offer rate. Students’ application and offer rates to Oxford and Cambridge. As well as an overview of the outcomes listed above, counselors and school leaders can easily perform a deeper analysis of the factors that are driving these outcomes. Insights lets you analyse your student’s outcomes by four possible dimensions. Gender – how do the application outcomes of girls compare to that of boys at your school? Grades – how do your students’ application outcomes change when you segment them according to their academic grades? Destination country – what are the countries where students’ applications are proving to be the most successful? University ranking – how do your students’ outcomes change when you analyse their applications to the top 50 globally ranked universities? Or the top 200? Insights lets you easily filter and drill deeper into your student’s outcomes, using these four dimensions. Use your Insights demographic data to compare the application and offer rates of girls and boys at your school. You can also compare the aspirations of boys and girls, both in terms of where they are applying and how many applications they are submitting. Compare the aspirations and overall achievements of high performing students with those of lower performing students. Use this information to improve your school’s guidance programme ensuring it plays to your students’ strengths and weaknesses. How do your students’ acceptance rates in 2018 compare with those of 2014? How many more students are attending a QS Top 50 university than last year? Why has Germany suddenly become a more popular destination country than the USA? This simple visualisation gives you the ability to make long-term changes to your guidance strategy that will improve your students’ performance and drive results. But, as we said at the beginning, we wanted Insights to go further. Just think how powerful your data could be if you combined it with outcomes and trends from BridgeU schools worldwide. So with that in mind, let’s take a quick look at Benchmarking. In building Insights, we wanted to give you unique access to regional and international benchmarking data, making it easier to assess the competitiveness of your guidance strategy against other BridgeU schools. That’s why Insights also comes with a Benchmarking Dashboard, allowing you to see how your students compare with their peers, both regionally and globally. Students receiving at least one offer from a university. Your whole school offer rate as a percentage of applications sent. The average number of applications per student. The percentage of students receiving an offer from a QS Top 50, Top 100 or Top 200 university. It’s easy to drill deeper into any of the outcomes displayed on the Benchmarking dashboard using the same four dimensions as before – gender, grades, destination country and university ranking. Regional/national benchmarks – compare your performance with BridgeU schools in Asia, the Americas, Europe and China. Curriculum benchmarks – benchmark your students’ academic performance using either IB grades or high school GPA. How are girls and boys at your school performing compared to the BridgeU benchmark? 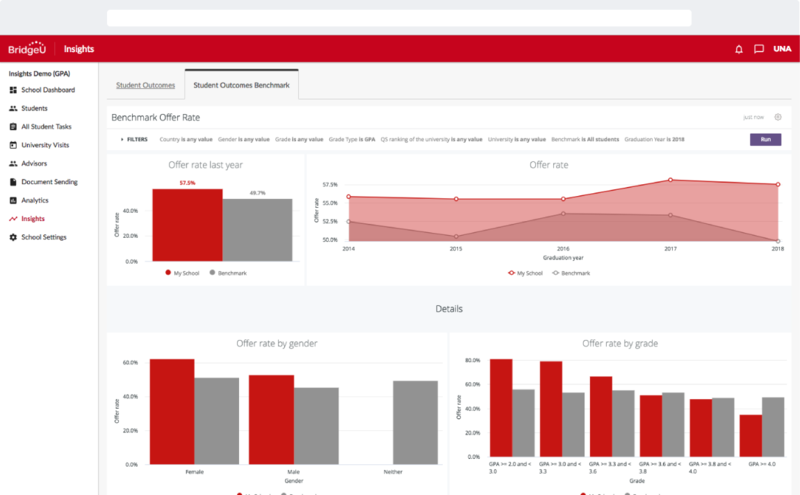 With Insights, you can how gender-related performance at your school relates to wider regional and international trends, allowing you to adjust your own guidance strategy accordingly. See how your students’ academic achievements compare with other BridgeU schools. Are your students with a high GPA outperforming the benchmark when it comes to offer rates? Are your less competitive IB students in danger of falling behind the benchmark? Get an overview of which countries your students are applying to, and how this compares to the BridgeU benchmark. Analyse how your high achievers perform against their peers when applying to QS Top 50 universities. 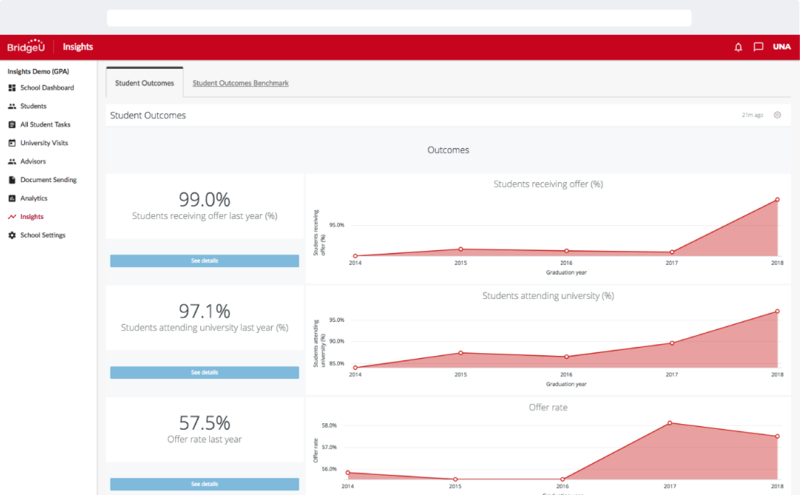 BridgeU benchmarking data allows you to compare how aspirational your students are in terms of their applications to university, and their overall level of achievement when receiving offers. With Insights benchmarking, you can leverage meaningful data from the largest community of global schools, using it to inform and drive your own best practice. We know from speaking to our partner schools that they value the ability to quickly collate data on their students’ key outcomes and share it with others in their professional community, be they parents, school principals or school boards. That’s why we’ve designed Insights to allow you to easily schedule reports and share important data as and when you need to. You can quickly convert data visualisations from any Insights dashboard into multiple formats, allowing you to instantly capture the trends and outcomes that matter and share them with others. PDF – convert your Insights data into a PDF for ebook, prospectus or presentation purposes. Email – quickly share your data in email format. CSV – download your raw data into a CSV file. For guidance counselors and school leaders who want to easily report on their results, Insights makes it easy to track and share the data that matters. Whether you’re after monthly, weekly or even daily reports on your school’s performance, Insights has you covered. It’s easy to schedule a report on any dataset in your Insights dashboard and share it via email. You can also customise your reports, tailoring the layout and settings to your needs. As you can see, we’re excited by the possibilities of BridgeU Insights. We’re excited that schools in our BridgeU community can pool data and resources like never before. We’re excited that BridgeU counselors and school leaders can tailor their guidance strategy each student’s needs and abilities. But perhaps most importantly, we’re excited to share it with you. 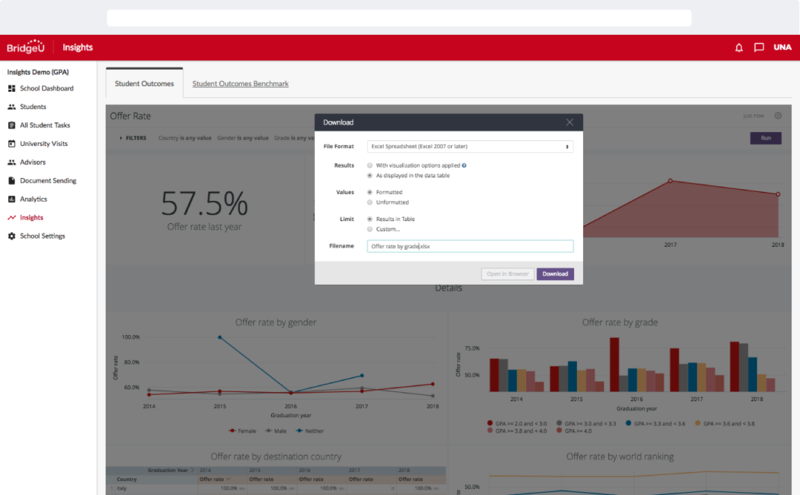 If you’d like to know more about how Insights can help you build a more data-driven guidance strategy and improve your outcomes, book a free demo. Cookies are tiny files that we use to give you an amazing service with BridgeU. Bits of BridgeU won't work without them, but you can change your browser's cookie settings at any time to stop us using them. Read More.